Wonderfox DVD Ripper is a professional application designed to rip DVDs to commonly used video formats. The program can rip all types of DVDs including encrypted DVDs like CSS protected DVDs, Sony ArccOS DVDs and all region 1-6 DVDs. With Wonderfox DVD Ripper users can also convert and transfer their favorite DVD videos to portable media devices, such as, iPhone, Apple TV, Android Mobile Devices, XBOX, PS3, PSP, Wii and more. Apart from ripping DVDs, the program is also capable of extracting audio from DVDs and grabbing screenshot in BMP or compressed JPEG format. WonderFox DVD Ripper is, as the name suggests, a user-friendly and professional DVD ripping software to turn encrypted or homemade DVD movies into a wide range of mainstream video formats so that they can be watched on the computer and other portable devices such as iPhone, iPad, iPod, Nokia N8, BlackBerry PlayBook, Motorola Xoom… Before actually converting the files, you can apply special effects to the source video, merge, trim, Crop, flip or rotate it, depending on your preferences to make personalized videos. Furthermore, the DVD ripper also supports extracting audio, grabbing screenshot and enable users to fully control output video quality or size by freely adjusting parameters. 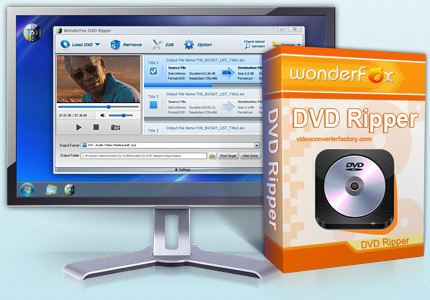 WonderFox DVD Ripper feature with simple user interface with only three steps operation (three steps – Load DVD > Set Profile > Get Start), making it suitable for all levels of experienced users or even novices. The software also provides fast ripping speed with hight quality of output videos. WonderFox DVD Ripper supports Intel Core TM, NVIDIA CUDATM and AMD to generate 6X faster video conversion speed. So when you use this professional and powerful DVD Ripper to rip DVD content, it will absolutely give you a fantasy feeling of satisfaction. The software supports all popular DVD formats and will continuously update to support the latest DVD copy protections. It is really one of the best solutions for ripping DVDs. Rip DVD to popular video formats, e.g. DVD to HD AVI, DVD to HD MP4, DVD to Mov, DVD to HD WMV, DVD to FLV, AVI, MP4, VOB, MKV, WMV, MPEG, MP3, OGG, FLAC, MKA, WMA, etc. Rip DVD to popular portable devices including DVD to iPad, DVD to iPhone, DVD to iPod, DVD to PlayBook, DVD to Xoom, DVD to PSP, DVD to Zune, DVD to Nokia N8, DVD to HTC HD7, etc. Ripping DVD contents with HD standard, convert DVD video to the HD video formats. Support ripping DVD audio into music file as mp3, wma, aac, flac, mka, ogg etc. Support grabbing screenshot from DVD video to JPG & BMP. Continuously update to support the latest DVD copy protections. CPU Priority technology help users charge the CPU resource freely for ripping process or others. WonderFox DVD Ripper normally costs $39.95 per registration code. WonderFox are having a giveaway of WonderFox DVD Ripper, where everyone can download a full version copy for free. The giveaway will be valid till Dec 17, 2013. Please visit the Giveaway page, and click on the “Get It Now” button to download the giveaway package. Make sure to follow the instructions in the License.txt file which is included in the package for proper activation. You have to install and activate it before the Giveaway offer for the software is over. Also WonderFox Christmas Promotion is unveiled now. If you or your audiences need to handle with photos/videos/DVDs, don’t miss this chance to get a good helper with up to 70% OFF discount deals so enjoy WonderFox Christmas Promotion. Thanks to Zoe from WonderFox for informing me about this promo.